I have a big fat craft/design/home decor crush on Danielle Thompson. She makes me want to paint my walls white, learn how to use a decent camera and take a digital scrap booking class. Every time I pop over to her blog, Flickr page, Etsy shop or Kitschy Digitals I come away inspired and with a sudden urge to thrift. If there was ever a gal who loved to create, and create well it is Danielle Thompson. That is why she is this month’s I Love to Create interview. Is the Tiny Bazaar your full time job? What is your top seller? No, Tiny Bazaar isn’t my full time job. I do enjoy it though as a little “side” project. : ) My favorite thing to make for my Etsy shop are accessories for Blythe, and I hope to make more of those soon. You can see my recent designs here. I have true admiration for artists that have a handmade business as their main source of income. It’s A LOT of work! My top sellers in my shop would probably be my Vintage Camera Embroidery Patterns and also my Happy Mail Polymer Stamp Collection. Help a Blythe illiterate girl out. Where does one get Blythe Doll? They are adorable and I can see how there is a whole sub-culture around them. How bad is your Blythe addiction? I’ve bought most of my Blythes on Ebay and have had no problems. I have also purchased used Blythes at Blythe Kingdom. I could see you owning lots of Blythes, Jennifer! She’s definitely an addiction. The first one you buy will have you hooked and before you know it, you’re already buying another. She’s not a cheap hobby, but she’s super fun. My addiction is pretty bad! I have 5 dolls and one on the way! But my collection pales in comparison to some. I’ve seen people with 20, 30 or more. It’s insane. : ) There are three things I love about Blythe: 1. She’s a very still photo subject (unlike humans), 2. I can dress her the way I’d want to dress, but could never pull off (60’s mod, hello!) and 3. She makes up for the fact that I’m surrounded by boys at home (I have two sons and a husband). I can live out my girly-ness through them. What has been the most popular how-to project on your blog? Anything that you made and people just went nuts over? I would say my fabric pumpkin tutorial. I still get hits on my blog for that post! People posted about that tutorial all over the web, so it’s received lots of traffic. It’s a fun one and I’m so glad people were/are excited about them! So your Kitschy Digitals digital kits are enough to make me want to learn to scrap book. Any suggestions for those of us that love our paper and glue stick on how we can use your adorable designs in paper crafting? I totally understand how it’s hard to let go of our tangible paper and glue and embrace digital! 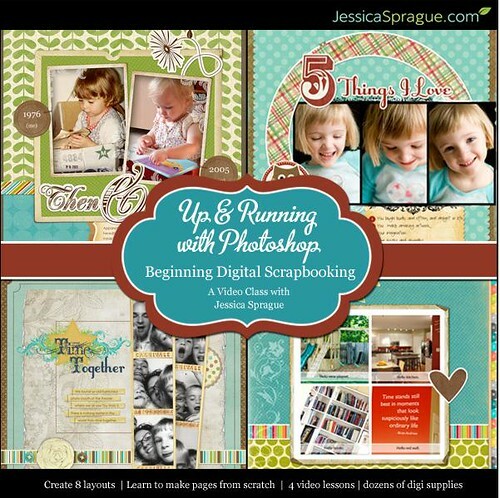 I’m a lover of handmade, but when it comes to scrapbooking, I’m a full digital convert. I used to create scrapbook art for various publications and just got so burned out! It was crazy time consuming. I would often spend five hours or more on a page. And it was MESSY. I live in a small home and space is definitely an issue. My “studio” is in the corner of our living room, so it was always a mess, which made me insane. I couldn’t “hide it away” in another room. SO, when I got into designing my own digital scrapbooking products (and they aren’t just for scrapbooking! ), I started creating some digital pages of my own with my kits and I realized how much I enjoyed it – yes, more than paper and glue. For me and my busy family life, digital was the way to go. It’s not messy, it’s a much faster process (I can get way more pages done in less time), it’s less expensive (the nature of digital files is that you can use them over and over again, unlike tangible supplies like a piece of patterned paper that can only be used once) and it’s earth friendly (no waste!). Another great thing about digital kits is that the files are high-resolution, so you can print them! Yes, if you can’t bare to let go of your paper and glue, that is ok! If you have a photo-editing program (like Adobe Photoshop for example) you just open the files and print them out. Easy-peasy. My designs are not only great for scrapbooking, but for any paper-crafting projects. If someone, like say me, wanted to get into Digital Scrapbooking where should we start? Any good books, online classes, computer programs you could suggest? You would need a photo-editing program. This is a good place to start with good information on what you need (it’s a free class!). Jessica Sprague, where I sell my kits, has other fantastic classes to get you started! For your Kitschy Digitals kits like the Vintage Stacked Flowers are those items in your own personal collection? Do you photograph your collections and then make them into parts of your kits? Yes! I usually create things using various supplies I have in my stash, photograph them, and then make them into digital elements. My background in photography and graphic design has made the process easier. I love it! Creating these digital kits is sort of a great combination of many things that I love: vintage, handmade, photography and design. Your photography is part of what makes your Thompson Family Blog so amazing! Do you have a degree in photography? What kind of camera do you have? Any tips for aspiring photographers? Thank-you! I do not have a degree, but before I got into designing my own products, my main focus was on improving my photography. I was especially into portrait photography. Everything I know has been self-taught. It took me a while to really “get it” and shooting in Manual has greatly improved the quality of my photos. I own a Canon 30d. There are some great photography classes at Jessica Sprague that you can find here. There are also lots of great photography forums out there so I suggest looking out for those. Flickr is also a great source of inspiration and often photographers are wonderful about sharing their knowledge. I love your home decor. Do you have a particular philosophy about your home decorating style? Where are some of your fave places to shop for eclectic and kitschy home décor items (if you wanna share fave Etsy dealers, flea markets, thrift stores)? 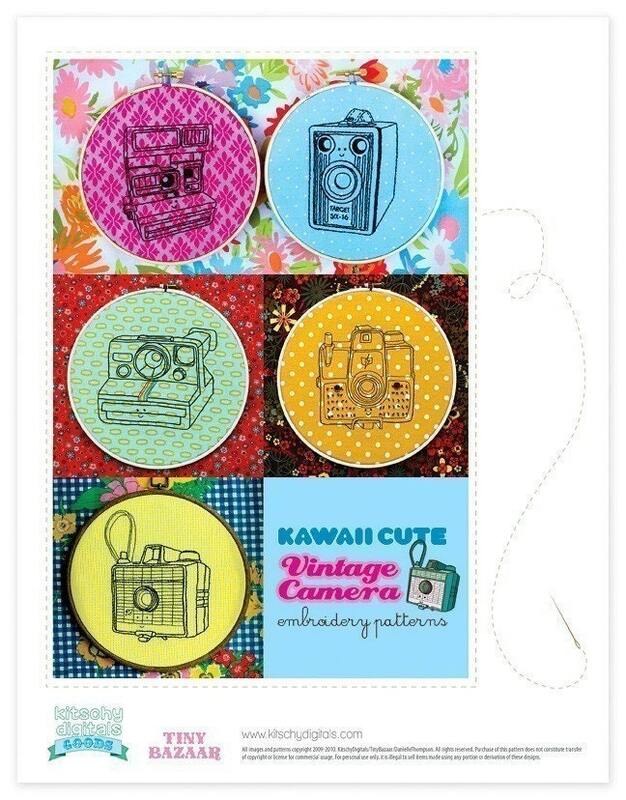 You are an artsy/crafty Jill of all trades – embroidery, photography, graphic design, crochet and more. If you had to choose just one to do for the rest of forever which would it be? Which do you find yourself doing the most often? What does the future have in store for you? Any new and exciting projects on the horizon we should be waiting for with baited breath? I always have various things in the queue that I’m working on, but I have one BIG project that is quite paramount. I’m having to do a lot of it myself so it’s very time consuming! I’m basically building and designing an entire website/shop that will be a one-stop shopping destination for…. well, I’ll keep that to myself for now. ; ) But please stay tuned on my blog over the next few months to get all of the details! It will be full of wondrous eye candy. Are you as smitten as I am? Ready to get your scrapbook on? Do you suddenly have the urge to play with dolls? See what I mean, she has that effect on people. Oh and pop over to I Love to Create to win a pack of Tacky Glue for those of you still playing with paper. Posted February 17, 2011 & filed under Home Decorating, I Love to Create, Interviews, Paper Crafts. Love the interview! Thanks for the intro. I'm heading over to her blog. I love Danielle. Shes awesome. I keep hoping one day I will run into her while thrifing in Atlanta. Im addicted to her blog. Good questions Jennifer.